On Wednesday, the first early signing period began and kids all across the country accomplished a dream by signing letters of intent to play college football. The spotlight has been primarily on the higher profile players accepting scholarships, but Wednesday is a day for all recruits and that includes walk-ons as well. Since Coach Scott Frost’s return to Nebraska, Husker fever has been going around the whole state and that has manifested itself in the form of a terrific early preferred walk-on class, something Frost said is a priority for his staff. “I was thrilled with the response,” Frost said during a conference call on Wednesday. “I flew back to Lincoln last Wednesday to talk to a group of kids [for the Homegrown Huskers event]. We’ve offered some walk-on spots, I think we’ll probably have some more to offer, but the response has been great. I’m looking forward to the talent that we can add to the program through the walk-on program. Thirteen preferred walk-ons signed with Nebraska on Wednesday, with 10 of them committing to Frost following the Homegrown Huskers event. 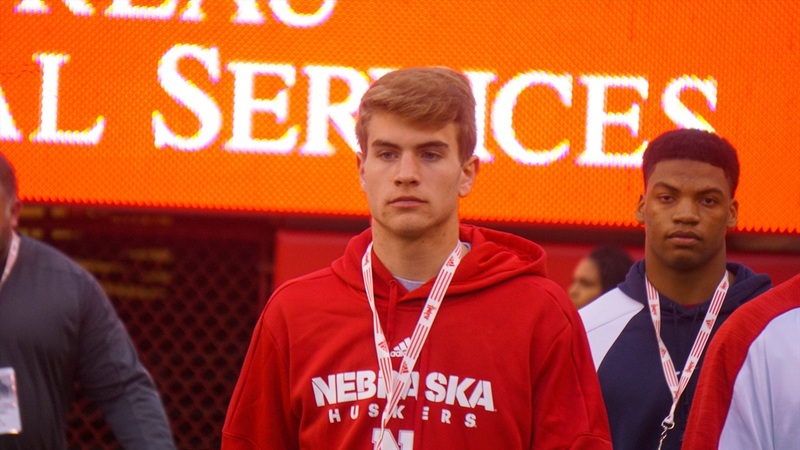 Justin Holm, a 6-foot-6, 190-pound wide receiver from Lincoln Southwest, was the first from this class to accept a preferred walk-on opportunity way back under the previous coaching staff and he quickly reaffirmed his commitment after attending the Homegrown Huskers night and meeting Frost. Holm finished this season with 44 catches for 795 yards and six touchdowns in 10 games. He has decent speed as a 6-foot-6 long-strider to get some separation down field, but he’s at his best attacking the ball in the air in jump-ball situations. He can do some damage after the catch as well with good shiftiness for a player of his height. Holm is so excited about Nebraska that he is planning to graduate high school and enroll early at Nebraska, a fairly common choice for scholarship recruits but a rare one for walk-ons. Before too long, Holm’s teammate at Lincoln Southwest, Cameron Pieper, pulled the trigger as well. At 6-foot-4 and 220 pounds, Pieper played defensive end and tight end for the Silverhawks but Nebraska recruited him as a long-snapper. “It’s just a dream come true to play for the hometown team and represent Nebraska,” Pieper said. But Nebraska wasn’t done mining the talent at Southwest just yet. The Huskers landed a third preferred walk-on commit from the school just recently when offensive lineman Collin Shefke committed shortly after the Homegrown Huskers event. At 6-foot-5 and 285 pounds, Shefke anchored an offensive line from the right guard spot for a team that accumulated as many rushing yards as it did passing yards this season. He was also productive on the other side of the ball as a defensive tackle. Nebraska still may not be done with Silverhawks, but those are the three committed at this point. The Huskers did pick up walk-ons from other schools, too. One of the most accomplished is Omaha Skutt linebacker Jake Archer, a 6-foot-1, 200-pound tackling machine with terrific instincts at linebacker. Archer helped lead the SkyHawks to back-to-back Class B state championship games and set the Skutt career record for tackles with 440. He also racked up 23 tackles in the semifinals against Gretna this year, the single-game record at Skutt. Archer played a bit of fullback for the SkyHawks as well. “It has been my dream ever since I was a kid to wear the red N on my helmet and to run out onto that field on game day in Nebraska,” Archer said. Speaking of Gretna, the latest commit for the Huskers is Gretna tight end/defensive end Joseph Johnson. The 6-foot-3, 220-pound Johnson caught four passes for 50 yards this season for the run-heavy Dragons, but as a junior he snagged 17 passes for 262 yards and three touchdowns. Where he made his biggest impact was on the other side of the ball, however, as a three-year contributor on defense. Johnson posted 115 tackles including 10 for loss as a senior and accumulated 228 career tackles including 19 for loss. Johnson is a big, strong kid with a knack for getting into the backfield and wreaking havoc. “I made this decision because I grew up watching Nebraska and ever since it's been a dream to play in Memorial Stadium in front of 90,000-plus,” Archer said. Johnson was also a key player for the back-to-back Class B state champions in basketball, and he hit the game-winning 3-pointer in the title game last year. Another versatile player in the preferred walk-on class who is best described as an athlete like Johnson is Millard West’s Brody Belt. Belt was a 5-foot-10, 170-pound workhorse running back for the Wildcats who racked up 2,883 and 51 touchdowns while rushing for 10.3 yards a pop over the last two years. However, he could potentially play slot receiver as well at Nebraska. “I chose Nebraska because Scott Frost is the coach and everything about Nebraska is amazing,” Belt said. Nebraska also got a Husker legacy in this class with O’Neill wide receiver Wyatt Liewer, the son of former Husker Jamie Liewer. Liewer is another big receiver at 6-foot-4 and 175 pounds who could potentially switch to safety down the road after putting on some weight. Liewer recorded a school-record 787 receiving yards as a senior including a 174-yard game, also a school record. He caught 62 passes (more than half O’Neill’s total for the season) and snagged five touchdowns. He also carried the ball 15 times for another 91 yards and a score. On defense, Liewer finished second on the team with 102 tackles including 7.5 for loss in just nine games. As a junior, Liewer helped lead the Eagles to a 13-0 season and a Class C-1 state championship. Keep an eye out for Liewer on the basketball court this season as well as he’s a double-digit scorer on what should be a contender for the Class C-1 title this season. After landing Bellevue West running back Jaylin Bradley as a scholarship recruit last season, the Huskers brought one of his blockers into the fold this year in offensive lineman AJ Forbes as a preferred walk-on. At 6-foot-3 and 275 pounds, Forbes has played all over both the offensive and defensive lines with great success but will start on the interior of the offensive line at Nebraska next year. "I just want to say its a privilege to be a part of Nebraska’s walk-on program," Forbes said. "It’s probably the most historic walk-on program in the country and to be able to be a part of something bigger than me is something really special. I’m looking forward to what the future has for me there and what I’m able to do in the scarlet and cream." Nebraska got a difference-maker on the other side of the line of scrimmage in 6-foot-3, 235-pound Yutan defensive lineman Colton Feist. Feist caused all kinds of havoc in Class C-2 this year, finishing the season with 110 tackls (83 of them solo), 22 tackles for loss and 13 sacks. He totalled 360 tackles for his career. Feist could potentially play linebacker at Nebraska as he adds weight as he is a strong pass rusher who is comfortable dropping back into zone coverage. "Growing up in a small town, I always had the dream of becoming a Nebraska Cornhusker football player," Feist said. "I always watched every game and just wanted to be playing on that field. The dream finally came true when Coach Frost offered me a walk-on spot that I couldn’t pass up." We’ve only covered several of the preferred walk-ons committed to Nebraska here. The others are Kearney Catholic quarterback Matt Masker (6-foot-2, 215 pounds), North Platte wide receiver Bryson Krull (6-foot-5, 220 pounds), Norfolk defensive end Ryan Schommer (6-foot-5, 230 pounds) and Lincoln Pius X linebacker/fullback Chris Cassidy (6-foot-1, 220 pounds). Holm also gave a shoutout to Kenny Wilhite, Nebraska’s director of high school relations, for all of his hard work bringing this class together. Wilhite was a tireless worker for the Huskers and a strong advocate for local talent under Mike Riley and has continued that under Frost. The scholarships recruits will get most of the attention on a day like signing day, but don’t be surprised if a few of these walk-ons grow into contributors down the road.